REINVENT the adventure that's designed around you. Say yes to a night out and the chance to turn heads. Reconnect with your friends in the cushy lounge interior, perfect for relaxing or living it up. Tap into available technology that pumps the music from any seat and brings you closer together. The evening starts up when Murano® does. 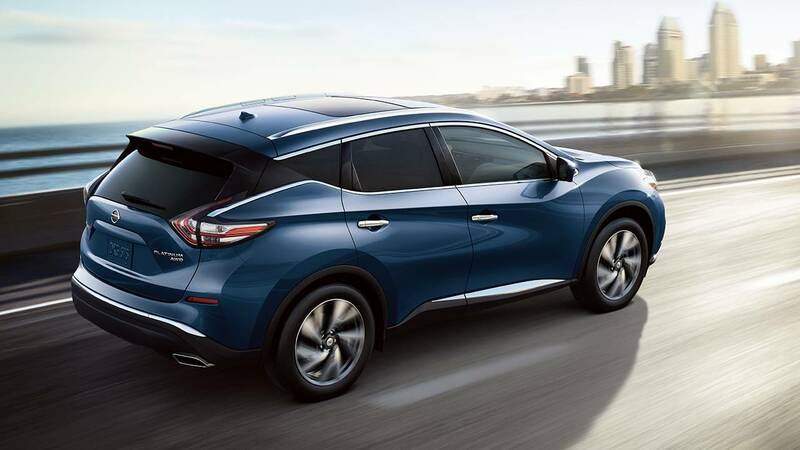 The 2019 Nissan Murano, the dynamic crossover that enhances all your EXPERIENCES. Inspired by the future of aerospace, Murano®'s striking aerodynamic body looks as though it was shaped by the wind. The fluid profile begins with the V-Motion Grille and sweeps into a signature floating roofline that appears to hover above the cabin, and ends at rear side pillars that resemble a jet's tail. The boomerang-shaped headlights integrate with the aerodynamic profile to become a vital part of the dramatic overall design. Available high-efficiency LED headlamps create a light pattern that replicates natural daylight. 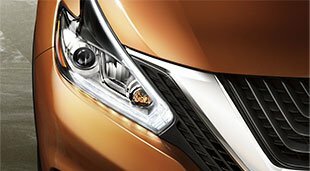 The standard LED daytime running lights dramatically arch around the headlights and provide a low-intensity, but highly visible light. An available feature, the 2017 Murano®'s sweeping, uninterrupted moonroof reaches over both rows of seats, so even passengers in the back get a clear view of the sky and experience an open, natural atmosphere rarely found in the back seat of a crossover. 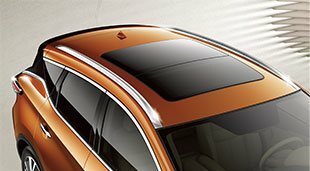 The unique "floating roof" gives Murano® a lower, lighter profile — an inspired contrast to the bulkiness of a traditional SUV. The pillarless effect carries through to the interior, giving it an open, airy feeling. Its interior is an expression of serenity. We've redesigned the control panel to be simpler and more intuitive. Ambient lighting gives the cabin a soft, warm glow. Subtle chrome and trim accents in Brushed Silver and Jasper Pearlescent complement the Cashmere or Graphite interior (available in leather). And whether it's a hot day or a cool night, the cabin can be waiting for you at a pleasant 22° C, thanks to the available Remote Engine Start System with Intelligent Climate Control. 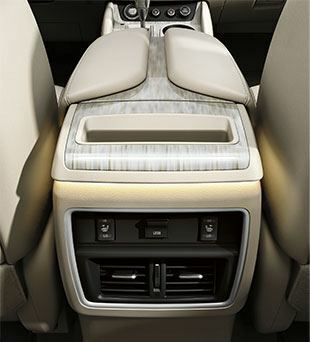 Rear passengers enjoy available outboard heated seats, plus a USB Connection Port with smartphone interface. Above you, the available expanded panoramic moonroof stretches from front to back and seems to breathe in light. An atmosphere this premium makes it easy to enjoy the journey — and might make your destination seem beside the point. It's got space and flexibility, and a seamless way to use it all. You can nearly double your cargo volume to 1897 L (67 cu. ft.) when you collapse the 60/40 split rear seats with just the pull of a lever that can be found in either the driver's area, or the cargo area*. Pull that lever again and they'll power up automatically. 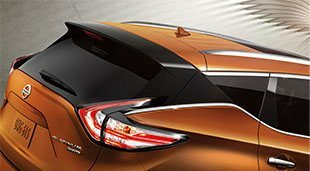 For simpler loading and unloading, control Murano®'s available power liftgate from your remote, the dashboard, or a button on the hatch. *Cargo and load capacity limited by weight and distribution. Always secure all cargo. Heavy loading of the vehicle with cargo, especially on the roof, will affect the handling and stability of the vehicle. Murano's 260-horsepower 3.5-litre V6 engine keeps you ahead of the pack when you need to be. And efficient fuel economy on the highway keeps it practical. Of course, it doesn't hurt to have aerodynamics that give you a drag coefficient of 0.31 – comparable to sports cars. Efficiency, brought to you by the Next-Generation Xtronic CVT.® Unlike conventional automatic transmissions, the virtually "gearless" Xtronic CVT transmission makes gear-hunting a thing of the past. Fully variable gear ratios mean it can hold the engine at the ideal rpm, giving you a wave of power when you need it, and achieving quiet, efficient cruising when you don't. Weather and road conditions can be unpredictable, but Murano's Intuitive AWD helps keep things smooth. Feel confident on the road, no matter where you go. The second you pull away, the available Intuitive AWD turns on, delivering power to both front and rear wheels for improved grip. 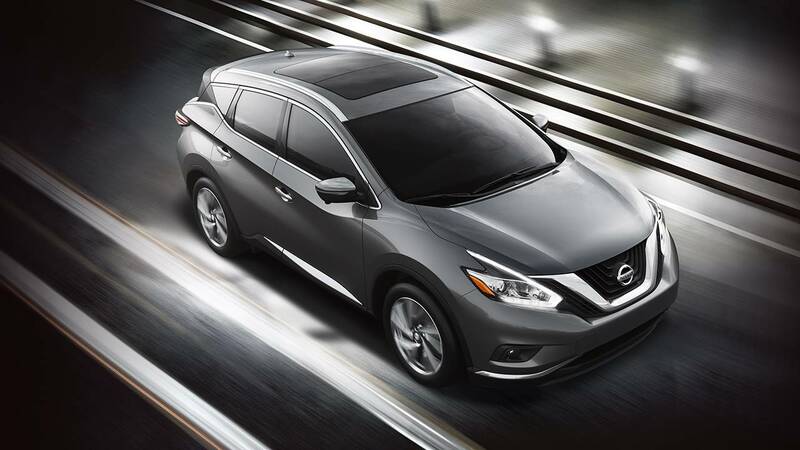 Once you’re up to speed, Murano® sends all power to the front wheels for improved efficiency. Then, for enhanced cornering control and traction, Intuitive AWD compensates by transferring some of that power from the front wheels to the rear, so you can rise to the occasion when driving conditions change. Call hands-free to invite a friend to dinner, or find the cheapest gas on your way out for the night, you can still focus on the most important thing: driving. Your passengers can access music, apps, and more on the 203 mm (8") colour touch-screen, and you can see all the info you need on a separate display for your eyes only. From turn-by-turn directions to caller ID or safety features, the Advanced Drive-Assist® Display puts it all right before your eyes — helping to minimize time looking away. A rearview mirror is great when backing up, but when it comes to parking, it's nice to see more than just what's directly behind you. 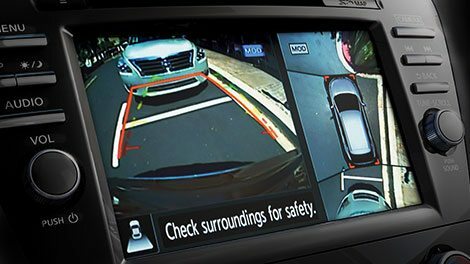 Murano®'s available Intelligent Around View® Monitor uses four cameras to give you a virtual 360º bird's-eye view of your vehicle, with selectable split-screen close-ups of the front, rear, and curbside views. And since all obstacles aren’t stationary, the available Moving Object Detection system can warn you about moving objects detected in your vicinity. With NissanConnectSM your Murano® becomes your smartphone's best friend, so no more separation anxiety for you. Your own hand-picked music and podcasts, traffic updates, weather and more are all just a swipe or a tap away, working seamlessly together through your smartphone and Murano®'s available 203 mm (8") colour touch-screen. Staying connected has never been easier. The available Apple CarPlayTM takes the things you want to do with your compatible iPhone® and puts them right on the Murano's display. Combined with NissanConnectSM, everything important to you is right within reach. Available Siri® Eyes Free unteathers the power of your phone. Google® search for a new restaurant, send a quick email, and a new event to your calendar. 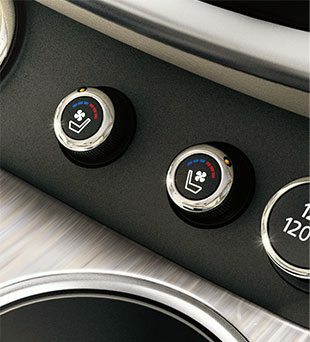 You can even find a gas station in a pinch – all through a convenient steering wheel-mounted button. 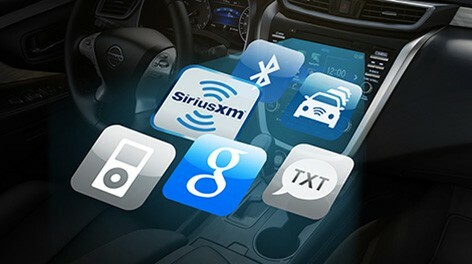 With available NissanConnectSM Services powered by SiriusXM®, you have a selection of plans and services ranging from remote engine start access on your phone to calling for help if the system senses there's been an accident. Like every Nissan vehicle, Murano® comes equipped with a suite of standard safety, driving, and convenience features designed to inspire confidence behind the wheel, and help make every ride better, safer, and more enjoyable. Smart technologies are designed to help monitor conditions. Like a warning to let you know you're straying from your lane, or a system that helps ensure you're travelling on properly inflated tires. When a collision is unavoidable, Nissan's Zone Body Construction helps absorb the impact while the advanced seat belt and air bag systems help protect passengers. TPMS lets you know when a tire is low, and Easy-Fill Tire Alert takes the guesswork out of filling your tires, with a beep of the horn when you’ve reached the correct pressure. Helps reduce wheelspin in low-traction situations. 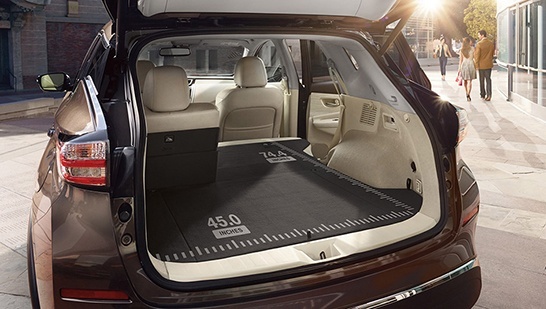 Sends extra force to the rear brakes when you have additional weight of passengers or cargo in the back. Nissan Advanced Air Bag System with dual stage supplemental front air bags with seat-belt and occupant-classification sensors. Nissan safety engineers have dedicated thousands of hours to evaluating hundreds of child restraints in Nissans. The result: an industry first, The Snug Kids® Child Safety Seat Fit Guide. This guide lists child seats that fit the rear seats of Nissan vehicles, as well as offers invaluable tips on correct installation. Download the latest Fit Guide here. Get Your 2019 Nissan Murano at Midway Nissan.